"Louisville Has the Race, But Lexington Has the Reason"
Louisville has the race, but Lexington is the place where Derby dreams originate - and where Derby legacies continue long after the horses have crossed the finish line at Churchill Downs. Those who have been to Louisville&apos;s Churchill Downs on the first Saturday in May know that the Kentucky Derby is the "most exciting two minutes in sports." But you haven&apos;t really experienced it until you visit Lexington, the Bluegrass city 68 miles east of Louisville. Known as Horse Capital of the World, Lexington is the center of the Thoroughbred horse industry. Lexington is where the world&apos;s top racehorses are bred, born, trained, officially registered, bought and sold, retired and buried. And it&apos;s been that way since before there even was a Kentucky Derby. In Lexington and the surrounding Bluegrass region, you can visit previous Derby champions or perhaps catch a glimpse of a future winner on the world&apos;s most famous and beautiful horse farms. You can see firsthand how Thoroughbreds are readied to make their run for glory. Join sheiks, millionaires and royalty at the world&apos;s most prestigious horse auctions. See, feel and even taste Derby traditions. And enjoy a special vantage point on America&apos;s most famous horse race. Bluegrass Note: A Derby horse carries with it down the homestretch the hopes and efforts of dozens of people who have been a part of its life: the night watchman at the foaling barn; the stable hand who helped pull the foal; the attendant who led the horse into the sales ring; the groom who feeds and cares for the horse daily; and the exercise rider. The Kentucky horse industry is responsible for more than 55,000 direct and indirect jobs, from artists to veterinarians. Many of the Bluegrass traditions that relate to the Kentucky Derby - such as horse farm tours and the Kentucky Horse Park - can be enjoyed throughout the year. The race itself, of course, happens just once a year, always on the first Saturday in May. For most people, the Derby Day option in Louisville is $80-per-person general admission. This means standing-room- only near the paddock area or braving the infield. If you are planning to attend the race in Louisville, it&apos;s a good idea to check out accommodations in Lexington. You&apos;re likely to find more options, and more reasonable prices - and it&apos;s only a little over an hour&apos;s interstate drive to Louisville. Bluegrass Note: Although Thoroughbred horse farms are located state-wide, by far the largest concentration-not only in Kentucky, but in the world-is in Lexington and the surrounding Bluegrass counties of Bourbon, Scott, Jessamine and Woodford. The 2017 Kentucky Thoroughbred Farm Directory listed over 465 farms in those counties. Enjoy the Derby the Bluegrass way. As an alternative to battling the throngs at Churchill Downs on Derby Day, many locals enjoy attending races earlier in Derby week, and then find a more civilized vantage point for the Run for the Roses. The world&apos;s largest Derby party is at Lexington&apos;s famous Keeneland Race Course (4201 Versailles Road, 859-254-3412) and has become a tradition itself. The track&apos;s pastoral setting and relaxed atmosphere is a perfect place to enjoy the race. The betting windows are open, and official souvenir mint julep glasses are available. You can view all the races of the day on TV monitors indoors, or super large-screen TVs outside. Of course, you won&apos;t see any live horses thunder past, but then, neither do a lot of the people at that other track on the first Saturday in May. Spread a picnic blanket in the paddock or walking ring and enjoy barbecue or chicken from the outdoor grills. Or, if picnicking is not your style, tables can be reserved in one of the dining rooms or at the Sales Pavilion Dining Hall, where many partygoers dress their table with elaborate decorations. You might want to participate in the late-morning handicapping seminar before you lay down your bet on the big race. Experts will teach you the science, or art, of picking a winner. A great outing for the whole family, Derby Day at Keeneland has popcorn and special activities for the kids, a hat contest for the adults and live music for everybody throughout the day. If all you need is a place to bet on the race, try out a unique wagering experience -- Keeneland offers "drive-through" betting on Derby Day. The Kentucky Horse Park also offers drive-through betting at Derby time. Get wagering done by taking advantage of the drive-thru betting windows that will be available at the Kentucky Horse Park Friday and Saturday, starting at 8:00 a.m. each morning. Drive-thru wagering is conveniently located at the front gate of the park, and admission is not required. And how about a Derby Day celebration with the Governor? No matter how late you party Derby Eve, you&apos;ll want to get up in time for the first race - and maybe even earlier than that. The Governor of Kentucky is expecting you. A big public Derby celebration in Kentucky&apos;s capital, Frankfort (27 miles west of Lexington via I-64), has been a Kentucky tradition since the 1930s. This year, the Old Capitol is the focus of activity, and downtown restaurants are offering breakfast specials. A free concert features bands from across the Commonwealth on the stage directly in front of the Old State Capitol. Kentucky artists will be exhibiting and selling their work. The event usually runs from around 9 a.m. to 1 p.m. Call the Franklin County Tourism and Convention Commission at 502-875-8687 for more information. Year-round, spot a slew of past winners. Derby Day isn&apos;t the only time to see a Derby winner in Lexington. Just as Hollywood has its "homes of the stars," the Bluegrass has the homes of the champions. Most of the living Kentucky Derby winners are stabled at the beautiful farms surrounding Lexington. California Chrome (2014) makes his home at Taylor Made. Bluegrass Note: Lexington is home to the official registry of all Thoroughbred horses, The American Stud Book kept by The Jockey Club. One of the most high-profile aspects of the registry is the naming process. Name applications go through comprehensive screening processes to make sure they meet Jockey Club rules. With over 450,000 names active in the Club&apos;s database - and another 100,000 champion names permanently retired, coming up with an acceptable name of 18 letters or less can be a real challenge. The Jockey Club processes about 150 name selections each day, about 36,000 a year, and has an interactive on-line registration system. Ponder Derbies past and future on the world&apos;s most famous and fabulous horse farms. Even if they aren&apos;t currently the home of a former champion, Bluegrass horse farms are a sight worth seeing, both for their beauty and their tradition. The red and white buildings of Calumet Farm, for example, are as essential a part of Derby history as the twin spires of Churchill Downs. From Whirlaway in 1941 to Strike the Gold in 1991, Calumet bred a record nine Kentucky Derby winners (and owned a record eight). The late Henryk de Kwiatkowski, a Polish-born aviation executive, purchased the farm in 1992, vowing to maintain its glorious reputation and promising it would never be "developed". The farm is now owned by Calumet Investment Group and operated by Thoroughbred owner and breeder Brad Kelly, rumored to be on of the 10 largest landowners in America. Even if you only drive by its Versailles Road location, you&apos;ll get a sense of the ingredients of a quintessential Bluegrass horse farm - lush pastures, lovely barns, and miles of plank fencing. Calumet&apos;s famous trophy collection can be viewed at the Kentucky Horse Park&apos;s International Museum of the Horse. It isn&apos;t just nostalgia for great horses of the past that makes visiting Bluegrass horse farms so thrilling. There&apos;s also the exciting possibility of spotting a future champion amid the gangly-legged foals frolicking in the spring meadows. Derby time is at the height of the January to July foaling season. Three years down the road, one of these frisky youngsters could be standing in the winner&apos;s circle at Churchill Downs. Through today, from Aristides, first Derby winner in 1875, to 2017 winner Always Dreaming, about 80 percent of Derby winners are bred in Kentucky. Contact VisitLEX, Lexington&apos;s convention and visitors bureau about guided and do-it-yourself tours of horse farms. Bluegrass Note: Fine horses and horse racing have always been important in Lexington (in 1789 there were more horses than people). The area&apos;s central role in the Thoroughbred industry began during the Civil War, when horse breeders in Maryland, the Carolinas and Virginia moved their horses "west" for safety. 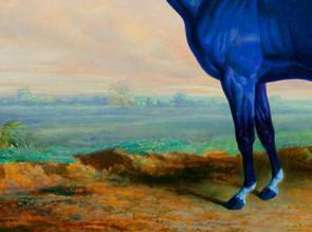 They discovered that their horses thrived in the Bluegrass, thanks to lime inherently in the soil, the gently rolling terrain and the favorable weather conditions. By the 1930s, the Lexington Herald-Leader had a standing offer to give subscribers free papers on any day that no horse bred within a 50-mile radius of Lexington won a race at a major track - an event that no one can remember ever happening. Go for history at the world&apos;s first park devoted to the horse. You can look at a variety of Derby-related exhibits at the Kentucky Horse Park. This 1,200-acre farm complex devoted to all breeds of horses attracts over 900,000 visitors each year. Near the park entrance, there&apos;s a life-size statue of 1973 Triple Crown winner Secretariat (right across from a statue of the other horse known as "Big Red," Man o&apos; War, the greatest Thoroughbred who DIDN&apos;T run in the Derby). Secretariat&apos;s Kentucky Derby trophy is on display at the Horse Park museum, along with memorabilia from Seattle Slew and other winners. The grave of jockey Isaac Murphy at the park is a reminder of the important role African-Americans played in the early days of the race. Fourteen of the 15 riders in the first Derby were African-American, and African-American jockeys won 15 of the race&apos;s first 28 runnings. Murphy, who lived in Lexington, was the winning Derby rider in 1884, 1890 and 1891. No other rider in history has even come close to matching his record of winning 44 percent of the races in which he rode. Enjoy a taste of Derby tradition. Another Derby-related treat is served in local restaurants and sold in specialty food stores: Derby PieTM. This really is a trademarked pie, with a very secret recipe. (However, chocolate, nuts and sugar seem to be involved.) Kerns Kitchen of Louisville invented the pie decades ago. Only those serving the real thing are allowed to use the name "Derby Pie" on menus. So when you see desserts with names like "Famous Horserace Pie" or "Bluegrass Pie" on restaurant menus, it means they&apos;re serving their own version of this Bluegrass classic. Bluegrass Note: Need a hat for your Derby festivities? Don’t panic. Long-time Lexington ladie’s boutique Jerome can assist you. (859) 269-5753. Burlington Coat Factory always carries a large selection of hats. (859) 268-2905. Both are just off Richmond Road. Another Derby taste you may want to try while you&apos;re in Kentucky is the mint julep. "The very dream of drinks," as 19th century Lexington lawyer and literary stylist J. Soule Smith called it, is a mixture of shaved ice, Kentucky bourbon, sugar, water and fresh mint and is a tradition long associated with the Kentucky Derby. Despite Smith&apos;s contention that one "who has not tasted one has lived in vain," some modern day drinkers consider the mint julep better talked about than drunk. First, make a mint syrup. Bruise (crush with the hands) a "whole handful" of mint leaves and combine them with 1/3 cup sugar and 1 cup water. Boil for five minutes, then strain. You should end up with about 2 tablespoons of mint syrup. Pour the mint syrup into your glass (preferably a sterling silver julep cup), Add 1 1/2 to 2 ounces of bourbon and mix. Now fill the cup with crushed ice. Rub fresh mint around the rim of the cup and garnish with fresh mint dipped in powdered sugar. If you would prefer to leave the mixing to someone else, you can find mint juleps offered at many Lexington restaurants and bars at Derby time. Try Dudley&apos;s on Short, 259 W. Short Street, or Merrick Inn, 1074 Merrick Drive, both favorite hangouts of the horsey set. The drink requires fresh mint, so Kentuckians drink this specialty primarily in the spring and summer. Kentucky distillers Buffalo Trace and Makers Mark bottle ready-to-drink mint julep beverages, available at local liquor stores. Bluegrass Note: Derby goers often agonize over what to wear, but leading stables around the world look to Lexington&apos;s Silks Unlimited to create their jockey silks. Each stable&apos;s jacket and cap features its unique and registered combination of design and colors. Not actually silk, these one-size-fits-all outfits are available in nylon, a nylon-satin blend, and the latest wrinkle in Derby fashion - aerodynamic designs and fabrics. Carry back a unique souvenir. In the Bluegrass, there are entire shops devoted to horse-related items. Name it, you can find it with a horse on it. Gift shops at the Kentucky Horse Park and Keeneland are equine-souvenir havens. Your Frame of Mind, downtown at the Lexington Center Shops, also holds horsey treasures. 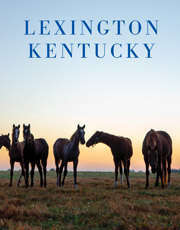 Stop in at the Lexington Visitor Center at 215 West Main for something related to Lexington&apos;s famous blue Big Lex! Each year, Churchill Downs issues an official Kentucky Derby glass. At the track these are sold with the mint julep, the traditional pre-Derby swill. You&apos;ll find the current year&apos;s glass and other "official" souvenirs in Lexington gift shops around Derby time. Derby glasses from past years, by the way, are quite collectible, as are silver and silver plate mint julep cups. Check out local antique malls and shops for these and other momentos from Derbies past.